Try to find a motorcycle helmet for Ralph. Do they make them for dogs? You’re probably wondering, why a surfboard? Because it’s summer, and I’m in full-blown summer mode. No, I don’t surf. I don’t think anybody in Dallas surfs. There’s hardly enough water here to take a shower. I just want a surfboard to lean against the wall. I want conga drums. I love music, but I’m afraid it’s too late to play the violin. And I can’t sing. I have a reasonable sense of rhythm and a lot of nervous energy, so conga drums just seem like the way to go. I’m purging, for my future life in the Airstream. In the past few weeks, I’ve pitched twelve lawn and garden bags full of unnecessary crap. It’s amazing how much stuff we buy…things we don’t really need. The thought of downsizing is so freeing, but I’m going to have to figure out a place to keep the surfboard…and the drums. Ralph loves to ride on the scooter with my boyfriend. He has goggles, but I wish his head was better protected. 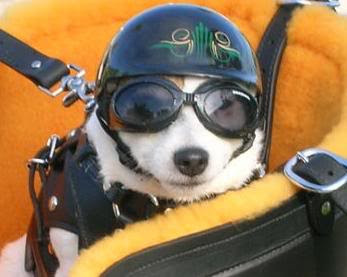 So I’m shopping for a helmet…and yes…they do make helmets for dogs! I know what he’s getting for his birthday! This afternoon, I want to make a lemon-blueberry pound cake with lemon syrup and lemon glaze. I got the recipe out of bon appetit. It requires the only size cake pan that I didn’t have. But I have it now, so I’m going to bake a cake for dinner tonight. If the cake is successful, I’ll post the recipe!